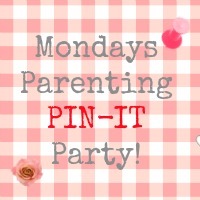 It may be a bank holiday but I am sure some of you will still find time to take part in this week’s Parenting Pin It Party. This week are welcoming back the lovely Aly from Bug, Bird and Bee hosting the linky, so nip over and tell her we said hello. Adding it to my PARTIES page on Ducks ‘n a Row so that I will be sure to come back again and again. I am not sure where to enter my pinterest URL so I guess I’ll do it here?